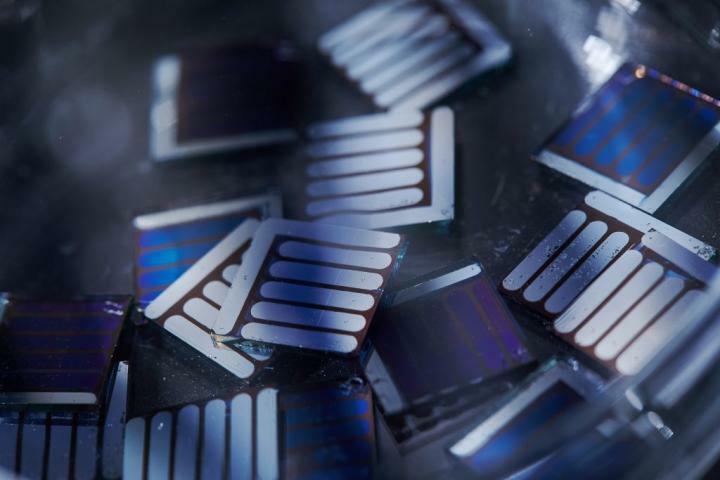 Photoactive layers used in solar cells convert solar energy into electrical energy. When these layers are exposed to sunlight, the excited electrons escape from the atom and generate free electrons and holes in a semiconductor. Here, the electrical energy is supplied by the movement of electrons and holes. The transfer of electrons is referred to as 'Channel I', while the movement of holes refers to as 'Channel II'. "Fullerene-based solar cells utilize only 'Channel I due to inefficient light absorption in the thin active layers," says Sang Myeon Lee in the Combined M.S./Ph.D. program in the School of Energy and Chemical Engineering at UNIST, the first author of the study. "New solar cells are capable of utilizing both Channel I and Channel II, thereby realizing high efficiency level of 12.01%." "This study highlights the importance of optimizing the trade-off between charge separation/transport and domain size to achieve high-performance NF-PSCs," says Professor Yang. "We will contribute to the production and commercialization of high efficiency organic solar cells in the future." "Our study presents a new pathway for the synthesis of non-fullerene photoactive materials," says Professor Yang. "We hope to further contribute to the production and commercialization of high-efficient OSCs cell." Shanshan Chen et al., "Ultrafast Channel II process induced by a 3-D texture with enhanced acceptor order ranges for high-performance non-fullerene polymer solar cells", Energy & Environmental Science (2018).